Our filters are designed largely for Whole House or Business Premises usage. Located in proximity to the incoming mains water. For homes this filter will fit under kitchen sinks if the space permits ( 8 x 17”). They are designed for a 1-2 year life depending on the volume of water used. 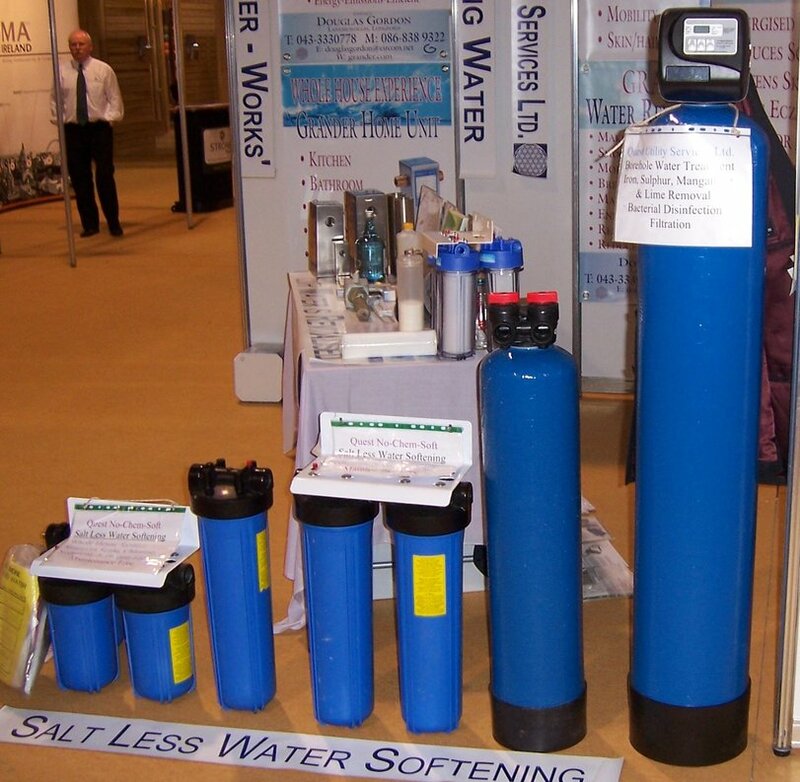 Filtration of mains water is easy to understand and treat. Well Water varies in quality from site to site and season to season, so it requires a water analysis before designing a filtration system. See page on Well Water. Excess Chlorine smell and taste. Removal of lead and other heavy metals. Protection from bacteria and boil water notices. Protection from E.Coli and cryptosporidium. Elimination of Carcinogenic trihalomethanes, which are a by product of chlorine disinfection. Removal of pipe sediment and suspended solids.. Solution: Quest Catalytic Carbon Whole House Filtration. Chemical free, fresh tasting and clear water. Treats whole house. Kitchen, Bathrooms and Garden water. Treats all of the filter issues above. Especially Fluoride, Lead and Trihalomethanes. Uses Activated Carbon and a Super Absorbent Iron Hydroxide coating. Costs € 0.50 per day for all the water that you can use. Chlorine is an important disinfectant . Its removal is recommended by hot beverage suppliers. Chlorine inhibits yeast/ sourdough development in bread making. Chlorine tastes obnoxious in drinking water. Chlorine causes skin rashes and red eyes on contact in swimming pools. The excess use of chlorine causes many health problems, like carcinogenic triholomethanes. Commercial applications for Quest catalytic Filters. Coffee shops, restaurants, bakeries, breweries, food processors, hotels, nursing homes, swimming pools and more. Filter selection: This depends on the water volume usage and application to determine the size of unit. Site Visit: This is required to assess the customer’s needs. Always begin with a site survey to assess customer requirements, water volumes, filter capacity, site specific needs and actual use of the water. Sight of a recent water analysis is advisable even if from the mains supply. Inspection filters in transparent filter housings. High temperature filter housings- more for descaler housings. High Flow and washable pleated filters for sediment and grit prevention. Electro-positive pleated filters to trap negatively charged bacteria. High volume big Bubba filters. Nitrate and nitrite filters to protect expectant mothers babies and young children. If you have a special need and it is not listed above please ask us on the Contact page.